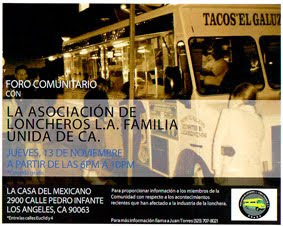 A victory for the taco truck community came down in a ruling that has voided Santa Ana's anti taco truck ordinance. This is good news for the Los Angeles taco truck community as the Santa Ana ordinance was almost identical to the current LA ordinance. The judge's decision voids Santa Ana's regulations about when food can be sold and how often vehicles must shift spots. SANTA ANA – An Orange County judge ruled Friday that Santa Ana can't require food trucks to move every 90 minutes or limit their hours of operation, a decision that strikes at the heart of the city's rules for the vehicles. After a four-day trial, Judge W. Michael Hayes determined that the city failed to prove the food vendors threatened public safety. He also found truck owners would suffer irreparable losses once the Santa Ana required them to move every 90 minutes and limited their hours from 9 a.m. to 8 p.m., according to a letter sent to attorneys Friday. "There was a lot of uncertainty, but with what the judge has said we're relieved," said vendor Roberto Guzman, one of the plaintiffs. "We feel good and want to work even harder." Hayes asked plaintiffs to draft paperwork to formally strike the rules. Other cities in Orange County working on regulating food trucks were watching the case. Santa Ana adopted its rules after residents complained of litter and noise from the trucks. The city also argued the trucks would worsen the quality of neighborhoods. Awesome! This is great news for the little guy. We should get together, drink beers, and talk about opening the gringo taco truck of the future! Or not, let's just leave it up to the pros to make it all good. this story from Raleigh NC. Justice served, now to get my tacos served. That truck on Whittier Blvd. I told you aboutis called Tacos Estillo Jalisco Arandaz. Whittier Blvd. and Woods St. in East Los Angeles. Thought your blog was great. Here's a great place you might like bar stool. I enjoyed your blog. Here's a great place you might like bar stool. I like your blog about student loan.